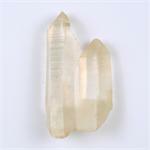 Crystal Properties: Lemurian Seed Crystals are a special variety of Quartz, a silicon dioxide mineral with a hexagonal crystal system. They come from Brazil,and are identified by the ladder-like grooves crossing the bodies of the crystals. Metaphysical Information: Golden Lemurians are crystals of remembrance. They aid the soul in recollecting its history, origin and purpose. This can include a great deal of past-life recall, including one’s lives in Lemurian and/or Atlantis. Most specifically, Golden Lemurians can aid one in discovering any past issues that may be holding one back from one’s spiritual destiny.